SAN JOSÉ, CA – With the stage of the S.J. Center for the Performing Arts transformed into a Seville’s courtyard, the lively sound of the Hispanic melodies of LUDWIG MINKUS, played by Symphony Silicon Valley, in the background, and all the Ballet San Jose’s dancers Dressed in the elaborate Spanish costumes designed by SANTO LOQUASTO, the company’s premiere of PETIPA’s “DON QUIXOTE,” staged by WES CHAPMAN and danced by guest artist JOSE MANUEL CARREÑO and JUNNA IGE in the principal roles, was formidable. 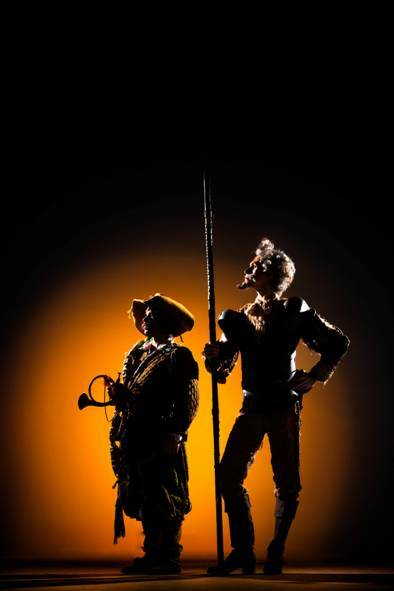 DON QUIXOTE the ballet, is the story of Basilio, a barber who is in love with Kitri, Lorenzo’s daughter, whose father wants to marry her, against her will, with Gamache an old rich man. 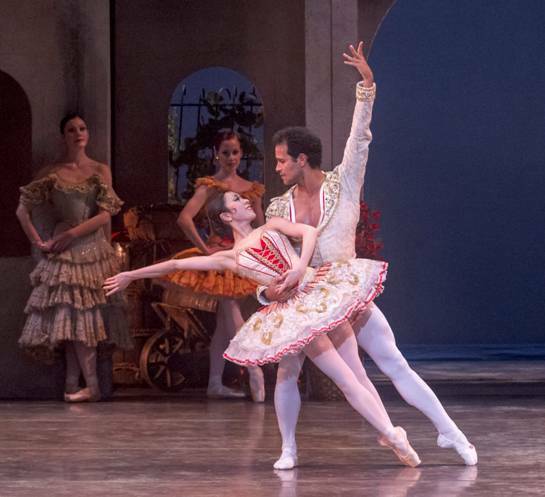 With Sancho, Don Quixote, comes to Kitri’s rescue because in his craziness he envisions her as his Dulcinea. Cut into three acts (instead of four) based after MARIUS PETIPA’s staging and using MINKUS' music, this night the story moved smoothly from beginning to end. In presentation and dancing, it was outstanding. The sets, designed by HANS CHRISTIAN MOLBECH for acts 1 and 3 and by SANTO LOQUASTO for act 2, were realistic in their representation of the hispanic places: A courtyard, a wind mill spinning its blades on the arid fields of Spain, and the interior of a two story Inn ornamented with lanterns hanging over the patio and garlands of flowers for the wedding’s party. When a ballet works as it is presented, there is little one can write about it and this ballet worked. On her part, JUNNA IGE, who was dancing the lead on Saturday’s performance with MAYKEL SOLAS playing the part of Basilio and was substituting for ALEXANDRA MEIJER who got hurt during rehearsals, on that night she shone as bright as a star. For two whole hours she was literarily on her toes, dancing her different dances with energy, spinning rapidly around the stage, jumping high in the air with both her her legs extended, doing plies and pirouettes and several artistic figures in her "fish duets" with Basilio. She even dared to literally jump several times into CARREÑOS’ arms. Perhaps the only flaw in this ballet is that it fails to develop Don Quixote, the principal character, represented by DAMIR EMRIC, because it shows nothing about his past.. We do not see him about to die, the burning of his books (the reason he went mad) his first encounter with Sancho, or his investiture as a “Caballero Andante.” In this ballet, Don quixote, just appears walking in the Plaza followed by Sancho. 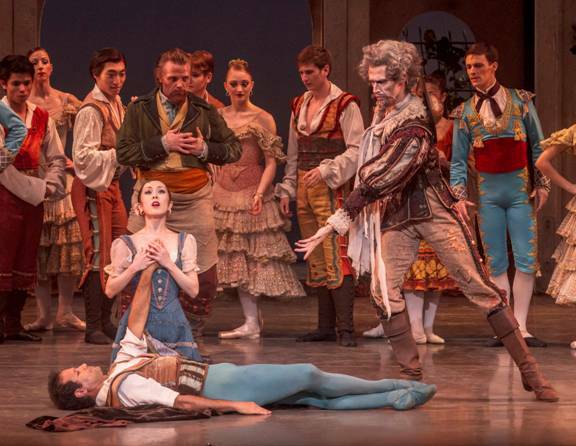 Through most of the ballet, his character just observes what is happening around him. His only misadventure shown was his fight with the windmill, his being caught the spinning blades and his falling to the floor. Then as a vision of his Dulcinea appears to him, in “his dream” he sees a group of beautiful maidens, in a dance ensemble that the superb choreography of CHAPMAN made the most enchanting in the whole ballet. On his part, RAMON MORENO, who played Sancho, in this ballte had also very little action. He was not tossed into the air in the first act by the town's people, and in spite of being one of the top dancers of Ballet S.J, in this work, MORENO was not given the opportunity to do a short solo or show better his marvelous gift for pantomime. The one who did have a chance to display his pantomime was GAMACHE, the old rich man that Kitri’s father wants her to marry, and we should say that MAXIMO CALIFANO, interpreted the role charmingly. He made the audience laugh just by walking on the stage with his cane, bouncing the curls of his ridiculous orange wig on his shoulders. We ought to remember that DON QUIXOTE which is for the dancers one of the most difficult ballets to perform because of the speed of its music, the variety of its steps mostly done in pointe , and the endurance which demands from them, in spite of being Classical, is a comic ballet. As “cupid” MARIA JACOBS-YU was both cute and masterful in her dance all dressed in pink holding a bow and arrow in her hands trying to get the couples to fall in love with each other. As Mercedes and Spada. NUTNAREE PIPIT-SUKSUN and RUDY CANDIA danced an artistic pas de deux as gypsy and matador. Artistically, he really got into his role elegantly spinning his red cape around his body. He may have needed to smile when flirting with her, but he was fine. We should add here that both the Matadores and gypsies dances were energetic and perfectly synchronized. Other good dances on that night were the ones interpreted by of BETH ANN NAMEY and KENDALL TEAGUE dancing the part of a gypsy woman and gypsy man in act 2 and KAREN GABAY's solo dancing as bar maid in the third act. 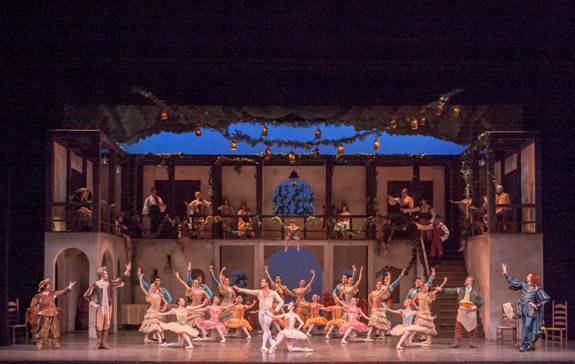 All the dances in DON QUIXOTE were synchronized and CHAPMAN's staging allowed the audience to observe every one. As Conductor, GEORGE DAUGHERTY needed more "UMP" in the syncopated music in the first two acts. Being Spanish, the melodies needed more emphasis in the down beats and changes in their dynamics. On the third act, however, the music was played with more energy and it sounded great. 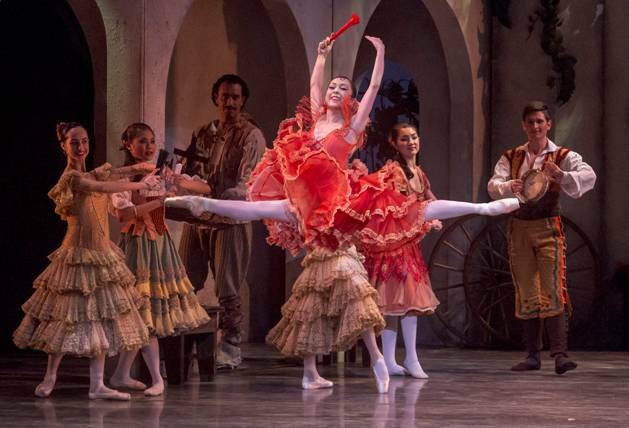 As a production, DON QUIXOTE was well executed and presented in sets and costumes as colorful as a rainbow. On that night, its famous Pas de deux, danced by IGE and CAREÑO was as masterful as its two dancers.